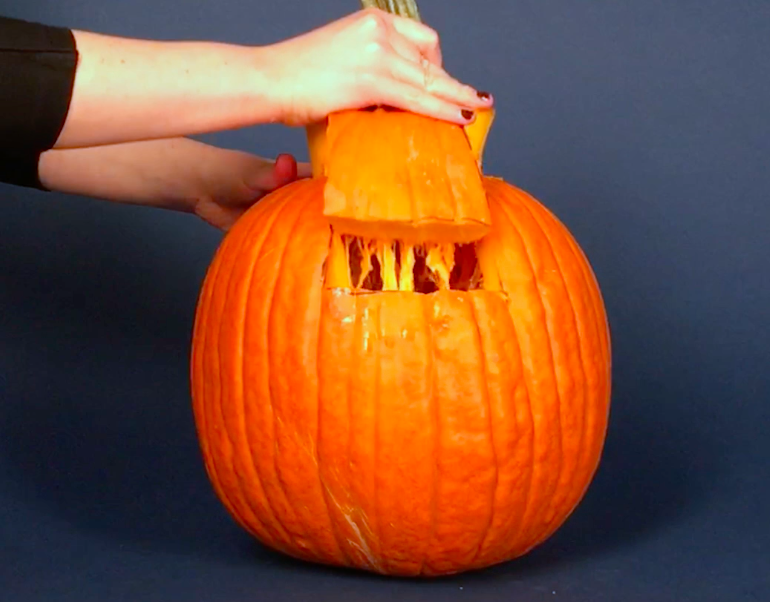 Carve the pumpkin of your dreams in no time. Does the prospect of hollowing out a giant gourd and carving a face into it get you down? Do you love the ~fall mood~ of jack-o-lanterns, but wish you could make yours look like the pumpkin in your head? Never be spooked by the prospect of carving again! Just use these simple tips to carve the pumpkin of your dreams. We carved this one ourselves in less than an hour! And by no means are we pumpkin carving experts. * A real pumpkin! Pick one with a flat-ish front side to make carving even easier. * A pumpkin-carving knife — look for one with sharp serrated edges. * An ice cream scoop (more on that in a second). * A printed pattern (you can also find a free selection by Googling for "pumpkin pattern"), or a sheet of blank paper with a pattern sketched onto it. * A toothpick, wooden skewer, or narrow nail (the kind you hammer into a wall). Trick #1: Cut your lid in the shape of a keyhole to make both scooping out the seedy innards and putting the top on later so much easier. We drew the keyhole with a Sharpie above to make it clear what we mean by "keyhole," but you can definitely just freehand the shape. Having the extra space at the back of the pumpkin for scooping, carving, and even candle lighting makes your jack-o-lantern job go more quickly. It also helps you put the lid on right every time, the first time. 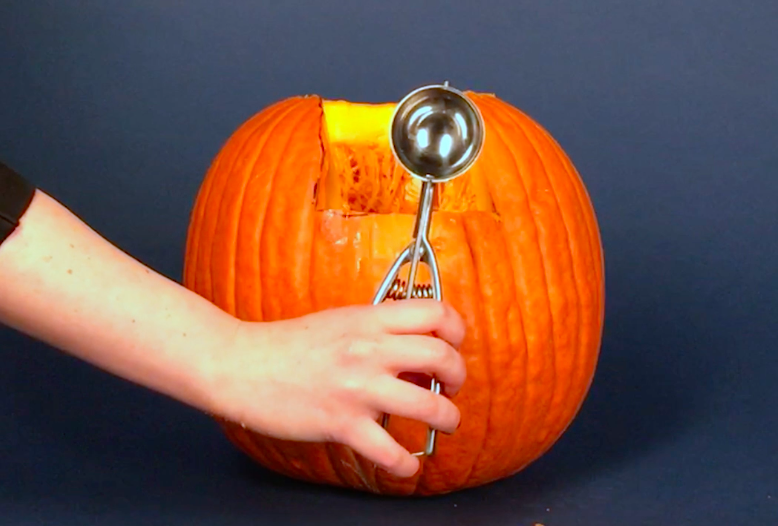 Trick #2: Scoop out the seeds and hollow out the pumpkin just a little bit by using an ice cream scoop instead of the little scoop that comes with pumpkin carving kits. You can scoop so many more seeds and guts at once, plus you can scrape down the insides with the sharper metal edges. We thought the most effective technique was to scrape all of the strings and seeds off the inside first, letting them land in the bottom of the pumpkin, then scoop it all out at once. Also, yes, our scoop is ~technically~ a cookie scoop, but it still worked well (hey, it's what I had at my house). An ice cream scoop — especially one with a point at the top, like this bestselling one — would probably work even better. 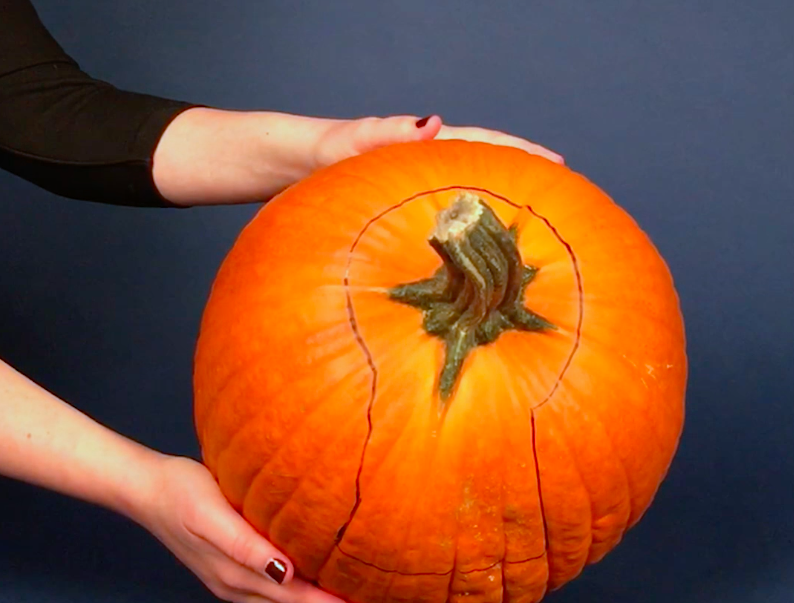 Trick #3: Transfer your pattern to your pumpkin with a piece of paper and a wooden skewer. This is an easy way to help kids design their own pumpkins without drawing all over the pumpkins themselves, which can be a bumpy experience. Just double check that whatever pattern you're using will work with a pumpkin cut-out. For example, this 100 emoji pattern would have not worked if the zeros didn't have a little at white space at the top of each. Tape all four sides of your pattern down using a strong tape. We used mailing tape, which worked perfectly, and masking tape would also be a good choice. Skip the simple office tape, which may fall off the pumpkin's surface mid-process, and the duct tape, which may be difficult to peel off or leave a residue. It also helps to rinse down and dry the pumpkin, first. Use your skewer, nail, or toothpick to poke holes around the edges of the pattern, like a connect-the-dots for where you want to carve. You also don't have to perfectly place your dots along the pattern, but try to stick to it as much as you can. Remember to trace just along the outsides of the black parts of the pattern — so for this pumpkin, we left the white parts at the top of each zero alone, so the inside of the zeros would stay attached. You can see the faint outline of the dots I poked here. Carving time! 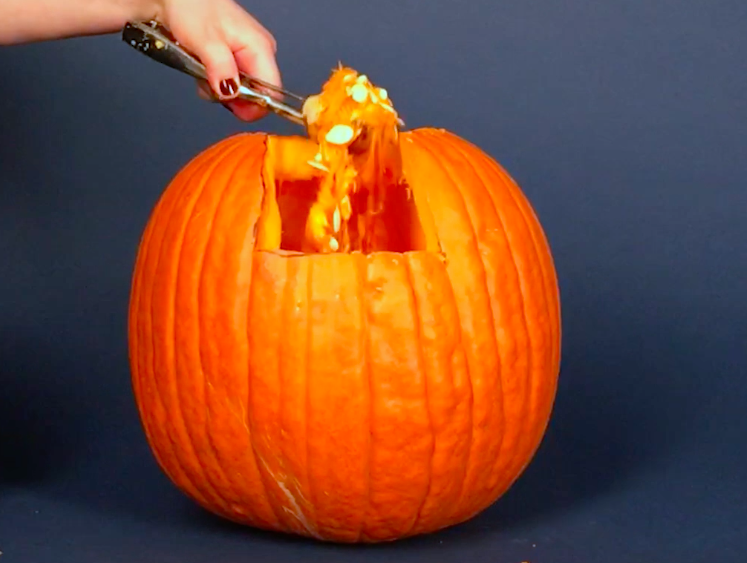 Carve with your pumpkin knife, connecting the dots of your pattern. Gently poke out each shape after you've gone all the way around. This will go super fast, I promise! Fill with candles, put the lid on, and you're all done!